Since the launch of the first instax camera in the late 1990s, FUJIFILM has continued to innovate instant cameras and make them accessible in today’s digital age. Through instax, people all over the world can still experience the joy of having physical mementos of their precious memories. In celebration of reaching sales of 20 million units of instax cameras worldwide, Fujifilm Philippines has released a special package called the instax Harajuku Combo. The Harajuku Combo includes one (1) instax mini 8 camera, one (1) pack of instax mini film glossy (10 sheets), one (1) instax film box, one (1) instax album, one (1) instax photo frame, and two (2) instax gift cards in yellow, blue, or red with the colors packaged at random. 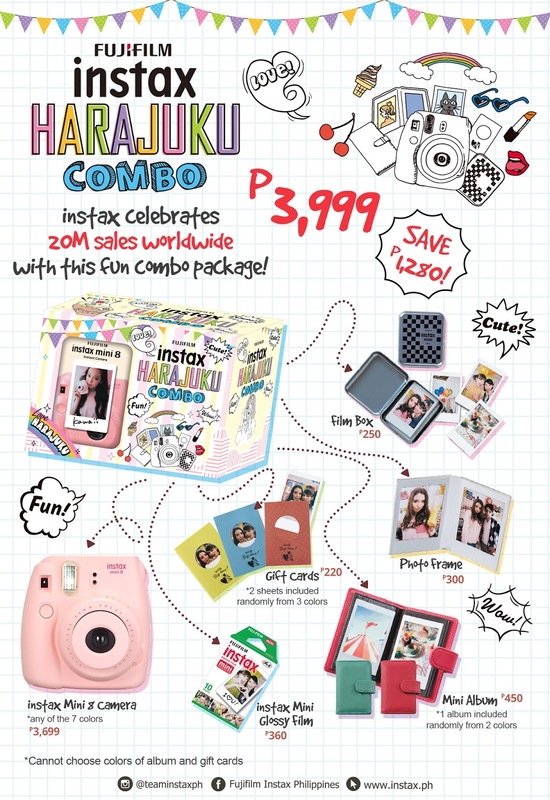 Valued at Php5,279, save Php 1,280 when you avail the Harajuku Combo at Php 3,999.The package will be offered as a complete set and must be ordered together with the instax mini 8 camera. Customers are free to choose which colors of the instax mini 8 they intend to purchase. Cute and compact, the instax mini 8 camera is ideal for daily use. Its popularity has grown so huge that it revived the interest of today’s millennials with cameras that allow users to print their pictures instantly. The instax Harajuku Combo is available in Fujifilm-accredited stores and distributors nationwide this August.